The following comments about attractions in Cleveland have been posted from individuals. We believe that the best reviews of Cleveland, Ohio (OH), OH USA are written by travelers and holiday makers who have experienced Cleveland first hand and want to share their thoughts. Can you share yours? Please help us expand this section of our Cleveland World Guide. 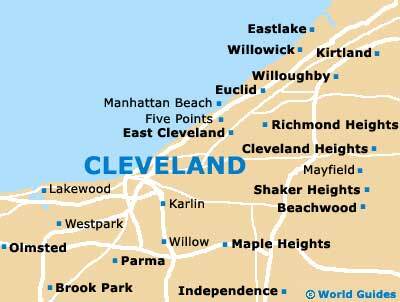 Let us know what you think about the attractions in Cleveland, Ohio (OH) USA. Submit comments about Cleveland attractions here. 'Laid back' is a good way of describing what you can expect if you hang out in the Tremont neighborhood. It has a very distinctive relaxed vibe. You don't have to walk far to find the bars and restaurants, if you need some food or drink. There were also some nice art galleries here, and these stayed open until quite late. enjoy a sandwich. There are even a few nice parks around the downtown district. The Museum of Natural History is really good. There are two stories and each floor is cram-packed with goodies. I enjoyed experiencing what an earthquake actually feels like, and the space exhibits. When you arrive, do find out what time the talks and demonstrations are so that you don't miss them. There is a good planetarium, although the admission for this is extra. I personally thought it was well worth it, but then I've never been to a planetarium before. Please note that these Cleveland, Ohio (OH), OH USA comments and reviews are posted by individuals and are not necessarily the views of World Guides.